Gregorian Chant is necessary for the Traditional Mass in its more solemn forms: Missa Cantata (one priest and servers: 'Sung Mass') and Missa Solemnis (with priest, deacon, and subdeacon, and servers: 'High Mass' or 'Solemn Mass'). The 'propers' of the Mass as well as the 'ordinary' must be sung, and although simplified versions are available, the standard version of the propers - introit, gradual, alleluia, offertory and communion - offer a challenge even to experienced singers. The music is sublime, but requires effort and training on the part of a dedicated group of singers. To provide a worthy rendition of the Chant for the Holy Sacrifice of the Mass is therefore a major part of the work of the Latin Mass Society, at both local and national levels. For a selection of useful free MP3 Chant downloads, see here. "Gregorian Chant has always been regarded as the supreme model for sacred music, so that it is fully legitimate to lay down the following rule: the more closely a composition for church approaches in its movement, inspiration and savour the Gregorian form, the more sacred and liturgical it becomes; and the more out of harmony it is with that supreme model, the less worthy it is of the temple. "The ancient traditional Gregorian Chant must, therefore, in a large measure be restored to the functions of public worship, and the fact must be accepted by all that an ecclesiastical function loses none of its solemnity when accompanied by this music alone. "Special efforts are to be made to restore the use of the Gregorian Chant by the people, so that the faithful may again take a more active part in the ecclesiastical offices, as was the case in ancient times." The wider context of this motu proprio, issued in 1903, was the work of restoration being done in the monastery of Solesmes in France, where careful work on manuscripts was making possible more and more accurate editions of the Chant as it was first written, and not as misunderstood or simplified in later centuries. "The Church acknowledges Gregorian chant as specially suited to the Roman liturgy: therefore, other things being equal, it should be given pride of place in liturgical services." "Down the centuries, Gregorian chant has accompanied liturgical celebrations in the Roman rite, has nourished men's faith and has fostered their piety, while in the process achieving an artistic perfection which the Church rightly considers a patrimony of inestimable value and which the Council recognized as "the chant especially suited to the Roman liturgy." "...the liturgical reform does not and indeed cannot deny the past. Rather does it "preserve and foster it with the greatest care". It cultivates and transmits all that is in it of high religious, cultural and artistic worth and especially those elements which can express even externally the unity of believers." Sadly, the words of the Popes and Councils has not always been heeded, and after the Second Vatican Council the use of Chant went into decline, and today is little known in parish churches. The services at which it is most likely to be found, outside the monastic Office, are those in accordance with 1962 Missal. The Latin Mass Society has been at the forefront of preserving and promoting the Chant since its foundation. Scholas and choirs singing the chant at the Traditional Mass are to be found in many parts of the country, working closely with Latin Mass Society local Representatives to provide singing of the highest possible quality for the Mass. Over the years LMS Representatives have organised Chant workshops directed by recognised experts. While important LMS events frequently bring in professional choirs, it has long been realised that the development of scholas and the provision of expert training is essential for the long term. The culmination of these efforts over many years was the launch of the Gregorian Chant Network. 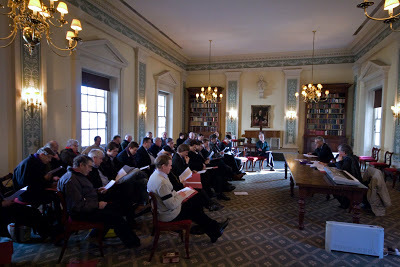 This was the initiative of the Latin Mass Society in conjunction with a number of other groups committed to promoting the Chant, such as the Schola Gregoriana of Cambridge founded by the late Dr Mary Berry, and including all the local scholas and choirs singing the chant in different parts of the country. 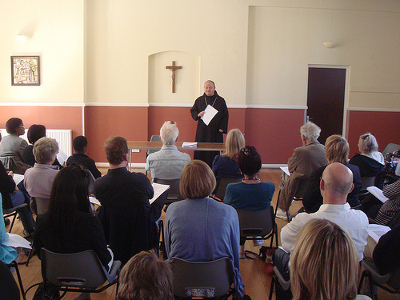 At its launch in January 2010, nearly forty Chant Directors and teachers were addressed by Dr Joseph Shaw, Chairman of the LMS, and Colin Mawby, former Director of Music at Westminster Cathedral. The meeting agreed to the basic principles of the Gregorian Chant Network: to organise chant training and to develop the skills and enthusiasm of the Chant Directors themselves. Colin Mawby, the distinguished composer and former Director of Music at Westminster Cathedral, gave the keynote address on the importance of Chant, followed by a fascinating practical session on methods of conducting the Chant embedded below (40 minutes). The meeting concluded with First Vespers of Septagesima Sunday in the Little Oratory, led by Fr Anthony Alexander. The Latin Mass Society publishes information on it's events calendar on forthcoming chant training events organised by a variety of individuals and organisations. Scholas and Choirs with an interest in chant are encouraged to sign up to the Gregorian Chant Network as affiliates. Chant Directors from around the country were invited to attend the meeting to launch the GCN, and more than 20 attended; since then the number of affiliates has risen to more than 30. The chance to meet chant practitioners from other parts of the country was enormously appreciated by chant directors who sometimes work in a degree of isolation, and it was agreed that such a meeting should be organised every two years. It is also hoped to organise a training event specifically for Chant Directors and the most experienced singers; contact the LMS Office if you would be interested.